OK I’ll be honest, Ivan Vanko isn’t a favourite character of mine (though I find him quite a fun character) I just literally couldn’t think of another character in the Marvel Cinematic Universe whose first, last or code name began with the letter “I”. I googled it and everything. I do think Ivan Vako makes one of the best villain introductions in the MCU. 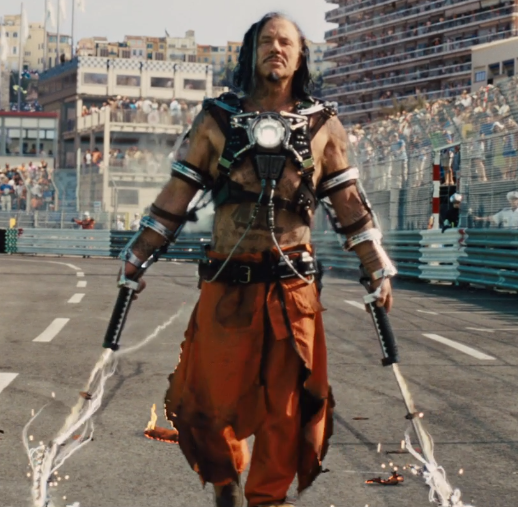 How he invades the racetrack at the Monaco Grand Prix, cutting up cars and causing multiple explosions with his arc reactor-powered electric whips definitely makes an impression. I also like how Vanko takes none of Justin Hammer’s nonsense. When Hammer breaks him out of prison and plans to use his knowledge of arc reactor technology to make him rich, Vanko appears to go along with it when in actual fact he’s got his own plans. I love it when he just rips apart Hammer’s robots as he thinks they’re useless and totally ignores Hammer’s freak-outs and then just demands that he get him his pet bird. My favourite line of Vanko’s is “If you can make God bleed, the people will cease to believe in him.” It’s from when he’s talking to Tony Stark and how he plans to show the world that the Great Tony Stark isn’t infallible. I think it’s a great line that has even more meaning now as in Infinity War Tony did manage to make Thanos bleed (in fact he was the only one except Thor to do so) so there’s the idea that Thanos isn’t undefeatable either. Iron Man 2 gets some hate, but I think it’s a fun film with a fun villain that has a larger than life personality as he’s out for revenge.